Want to Take Lab Sustainability to New Heights? Join us in Denver! 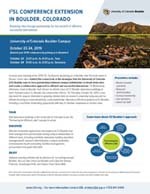 The I2SL Annual Conference and Technology Fair is the leading international conference focused on energy efficiency and environmental sustainability in laboratories and related facilities. Through technical sessions, demonstrations, and exhibits, lab owners, operators, designers, engineers, safety mangers, and users exchange information covering the life cycle of the laboratory from design to use to disposal of products and packaging. I2SL expects more than 500 participants will attend the 2019 I2SL Annual Conference in Denver, plus an extended day at the University of Colorado in Boulder!